In order for nutrients contained in dietary supplements to effectively provide the important health benefits for which they are intended, it is critical that supplements are formulated with optimal absorption in mind. While this might appear obvious, the task can be easier said than done. Our digestive tract is essentially an aqueous environment, and although our bodies are equipped with systems (i.e, enzymes, bile acids, etc.) to assist with the absorption of fat and other compounds that are poorly soluble in water, there are numerous nutrients for which the body still has a very difficult time absorbing. For example, coenzyme Q10, a compound critically important for many metabolic functions, including the production of ATP, is extremely insoluble in aqueous systems. As a result, our body has a limited ability to efficiently absorb CoQ10. Although it is important to supplement the diet with these nutrients, simply adding them into a dietary supplement formulation such as a capsule or tablet is not going to overcome the body’s challenges with getting these compounds across the lining of the GI tract and subsequently into the blood. Fortunately, there are effective strategies and formulation technologies that allow for these poorly absorbed nutrients to be better assimilated by the body. Once such technology is the patented VESIsorb® delivery system, which represents a unique solution to improving the absorption and bioavailabilty of these poorly water soluble bioactives. The VESIsorb® delivery system functions in a manner very similar to the body’s natural digestive process, in that it results in the formation of something very similar to an association colloid, allowing fat soluble nutrients to be contained in extremely small droplets and distributed within an aqueous system. In other words, it provides compounds that normally would not be soluble in water with the ability to become water miscible, with the ultimate result being enhanced absorption of the compound contained within the droplet. First, a quick review of what a colloid is will help to better understand and put in context exactly what is happening. What do smoke, fog, and milk all have in common? They are all colloids, systems in which there is a mixture of both a solvent and some form of suspended particle. Technically speaking, these systems have two phases, one known as the continuous phase (also known as the dispersion medium) and the other known as the dispersed phase. The particles (i.e., droplets) are too small to be seen by the naked eye, and due to their size they do not settle out of solution. Colloids can take the form of an emulsion, where both of the phases mentioned above are liquid. An excellent example of this is milk, where liquid fat droplets are dispersed within the water content of the milk, forming a colloidal system. Colloids can also contain solids and gases, or liquids and gases. In the case of smoke, tiny solid particulates are dispersed in air, whereas in the case of fog, the colloid consists of liquid droplets dispersed in air. Now that we have a basic understanding of colloids, we can delve further into how the VESIsorb® delivery system functions. VESIsorb® technology closely mimics the manner in which the human body digests and absorbs fat. As noted earlier, it is well known that nutrients and drugs that are fat soluble may be poorly absorbed. As a result, they are often better absorbed when administered with a meal containing fat. One of the reasons for the improved absorption in the presence of fat is the enhanced solubilization of the ingested compounds by bile salt mixed micelles which are formed from the digestion products of dietary triglycerides (monoglyceride and fatty acids) and the presence of bile acids. 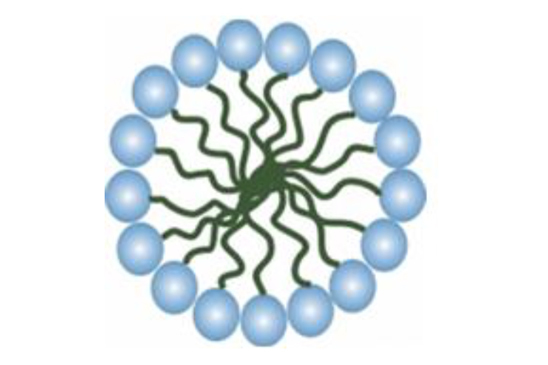 These bile salt-mixed micelles typically have a size less than 10 nanometers. It is also important to understand that individual lipid molecules, and not the micelles per se, are what cross the enterocyte membrane and are available for absorption. Once inside the enterocyte, dietary fatty acids and monoglycerides diffuse to the smooth endoplasmic reticulum, where they are resynthesized into triglycerides. Finally, the resynthesized triglycerides are packaged into chylomicrons and along with other nutrients are subsequently secreted into the lymph system. 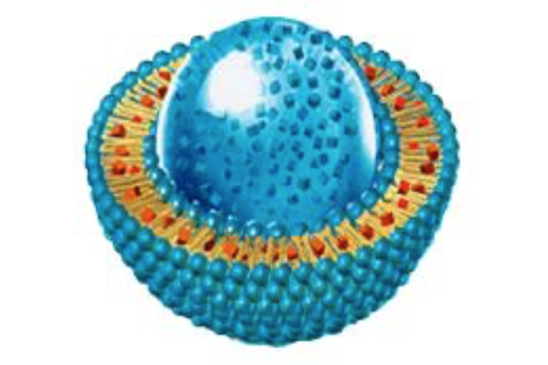 The VESIsorb® system is a lipid-based formulation that naturally self-assembles on contact with an aqueous phase into an association colloid that mimics the mixed micelles that are formed during the normal digestion and absorption process. Like micelles, VESIsorb® forms an aqueous dispersion when mixed with water, very similar to an association colloid. However, the dispersed phase is composed of both surfactant and oil and can be referred to as a micro-emulsion. 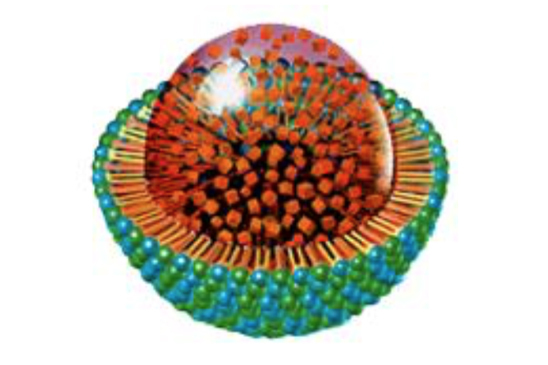 The dispersed phase of VESIsorb® can be envisioned as tiny droplets composed of an oily core (oil components/active ingredients) surrounded by a hydrophilic shell (emulsifiers). Compared to a micellar system, the VESIsorb® contains lower amounts of surfactant (which is highly desirable) and high amounts of oil (lipophilic core/center where the active substance is dissolved). It is a colloidal solution with extremely tiny (< 100nm), and highly flexible associates. The process that occurs after you ingest a product formulated with VESIsorb® can be thought of in three steps (characterized in the accompanying figure), all of which lead to the improvement of the absorption of poorly water soluble compounds. Step 1: Formation of the colloidal delivery system containing the drug – this occurs when the VESIsorb® system is exposed to an aqueous environment. Step 2: Diffusion of the colloidal system across the unstirred water layer. While the droplets that are created when the association colloid forms are typically less than 100nm, it should now be clear that this process mimics the naturally occurring mixed micellar transport system of the human body and is distinct from industrial engineered nanotechnology that may introduce environments and systems that are foreign to the body. 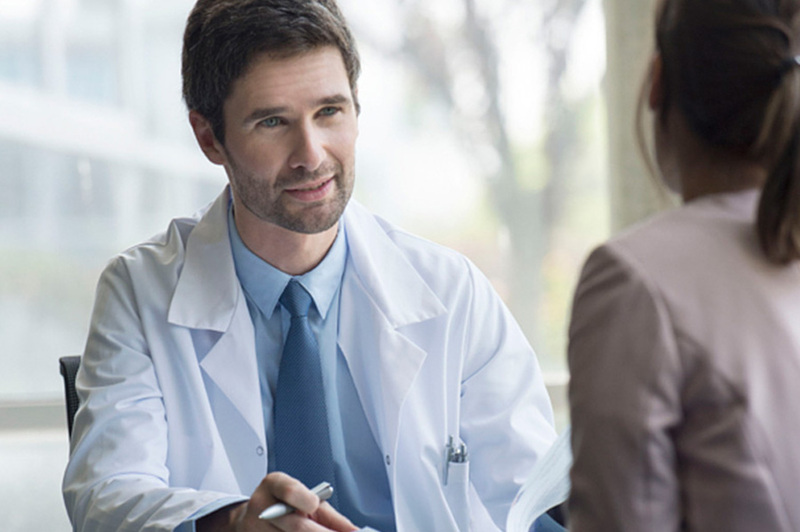 One interesting aspect of the VESIsorb® delivery system is that it is advanced delivery system that allows for it to be tailored specifically for each active or group of active ingredients. For example, CoQ10 has different chemical properties compared with resveratrol, and as result the composition of the VESIsorb® delivery system must be customized to allow for the proper and optimal formation of droplets (referred to as droplet conversion) when exposed to an aqueous system. It is not a one size fits all type of delivery system. The system must be able to “self-assemble” and form an appropriate association colloid when it interacts with water. Achieving this behavior takes significant research and development, but the result is well worth it (see accompanying figures comparing omega-3 fatty acids in VESIsorb® versus standard omega-3 fatty acids). Note how the VESIsorb® formulations, when mixed with water, self-assemble and go into solution, while other products containing similar fat soluble compounds simply will not mix in the aqueous environment. The ultimate goal of the VESIsorb® system is to allow for enhanced absorption of nutrients. This has been demonstrated in multiple studies, including a peer-reviewed clinical trial that investigated the absorption of VESIsorb® compared with other bio-enhanced delivery forms of CoQ10. 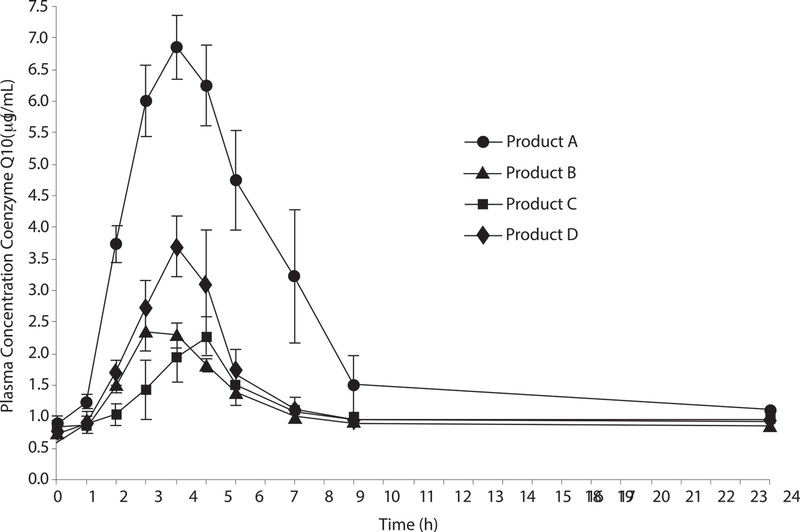 From the chart below, it is clear that the product formulated with VESIsorb® resulted in a significantly greater plasma CoQ10 level compared with the other products. Both a greater Cmax as well as a greater area under the curve was observed with the VESIsorb® formulated product. Enhanced absorption has also been observed with ubiquinol, omega-3 fatty acids, citrus polymethoxylated flavones and other compounds. 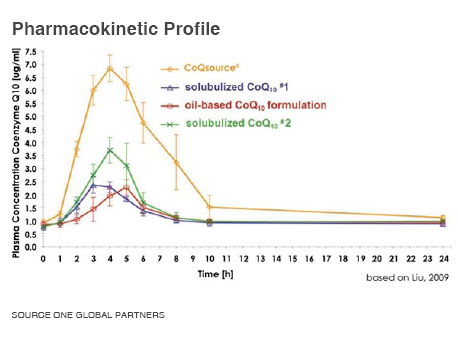 Preliminary data involving ubiquinol demonstrated an increase of 696% in peak blood levels (Cmax) of Ubiquinol. The relative bioavailability calculated using the area under the curve (AUC0-24h) was also increased by 485%. 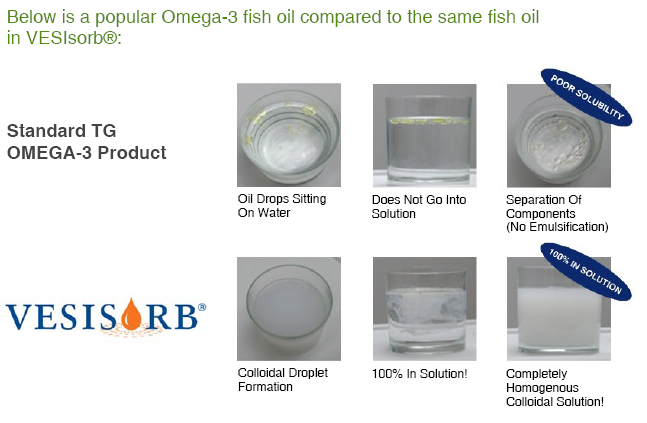 Additional preliminary data in humans comparing Omega-3 EPA oil to the same Omega-3 EPA in the VESIsorb® delivery system demonstrated an increase of 567% in peak blood levels (Cmax) of EPA. The relative bioavailability calculated using the area under the curve (AUC0-12h) was also increased by 487%. An emerging area of interest over the past few years had been centered around hemp oil and the various health benefits that it may confer. Hemp contains a wide array of fascinating compounds, many of which science is just beginning to better understand. Among these compounds are phytocannabinoids, compounds that can either directly or indirectly interact with one or both of the cannabinoid receptors in the body, known as CB1 and CB2. Compounds that interact with the CB1 receptor, such as THC, typically exhibit the psychoactive effects associated with cannabis. However, cannabis, as well as hemp, also contains many non-psychoactive cannabinoids, including a compound known as cannabidiol, or CBD. CBD may function primarily by indirectly acting as an agonist for CB2 receptors as well as interacting with other receptor systems in the body including the 5-HT1A and glycine receptors. CBD’s influence on these receptor systems may lead to numerous beneficial impacts on overall health and metabolic function. Terpenes are another group of compounds present in hemp as well as many other botanicals. These compounds are typically responsible for imparting the characteristic aromas that are associated with certain plant products. One such terpene is the sesquiterpene known as beta-caryophyllene (BCP), which can be found in many plants in addition to hemp, including oregano, black pepper, clove and thyme. Similar to CBD, BCP also acts as an agonist to CB2 receptors, and is therefore considered a dietary phytocannabinoid and is increasingly being studied for many different potential health-promoting effects. Interestingly, there may be a synergistic interaction among phytocannabinoids (commonly referred to as the “entourage effect”), including both CBD and BCP, as they may enhance and support each other’s function. Having both present together at meaningful amounts in a single formulation may offer significant benefits for the consumer. One of the challenges; however, is that due to their chemical properties, CBD and other phytocannabinoid components contained in hemp are poorly absorbed when taken orally. By incorporating a high quality hemp oil extract into the VESIsorb® delivery system, SourceOne has been able to successfully achieve a water-miscible formulation, in which the hemp oil and its associated phytocannabinoids are solubilized in water. This delivery system will allow the important constituents contained within the hemp oil extract to have the best opportunity for absorption in the body. is fully committed to expanding its research and development efforts around the VESIsorb® delivery system. Ongoing work continues to expand both the number of nutrients that can be utilized with the delivery system as well as the number of delivery formats for which the VESIsorb® system can be customized. TruEase® hemp oil extract is an excellent example of our commitment to always staying at the cutting edge of innovation. In addition to Hemp oil and CoQ10, the VESIsorb® system has been successfully developed using ubiquinol, vitamin D3, omega-3 fatty acids, polymethoxylated flavones, tocotrienols, phosphatidylserine, and more.